Hello friends! 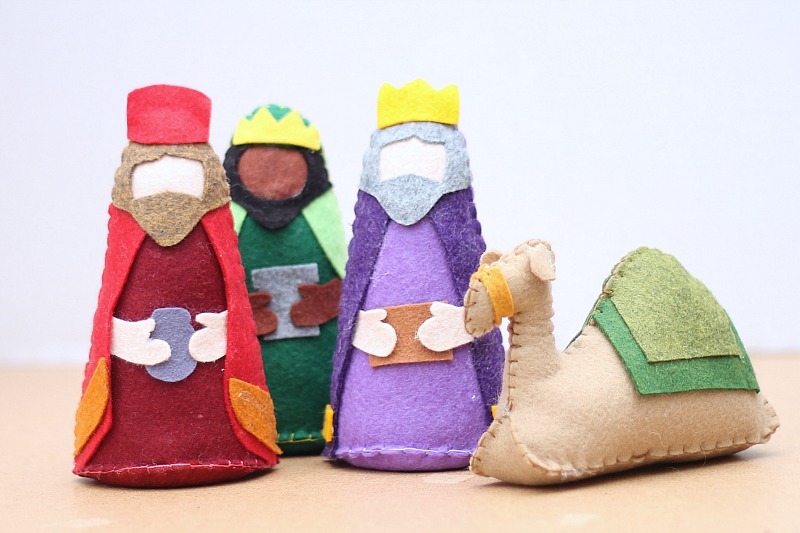 Thanks to my wonderful husband I had a little extra time in front of the computer this morning and was able to finish and list a project that has consumed much of my time lately: Felt Nativity Set Pattern. It is done, the pattern is as perfect as I can get it and it is available for you to purchase and start using right now. Right here, right now for only $7! I wish to order both the Nativity figures patterns AND the Nativity ornaments pattern but I cannot find any directions for doing that ??? I think the little felt roses are cute-would be great on a headband for my little girl named rose. 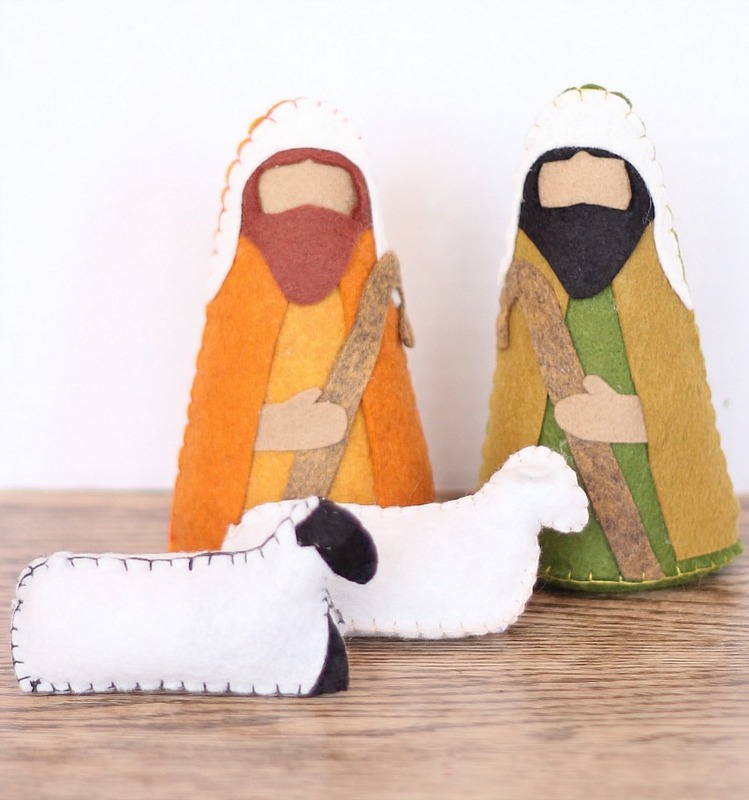 Loved the kitschy Christmas…and wouldyour felt nativity figures! I just bought the pattern but it does seem important to know how much of each color and what colors you used. This will be my first time to do a felt pattern (or any pattern for that matter) so I have no idea how much to get. The pattern should come with a sheet explaining how much of each color to get. And don’t worry! Felt is easy to work with and your colors don’t have to match mine! I love the pattern and really want to make the set but I’m not sure how much of each color felt I would need to be able to make it. I’m thinking about asking for the pattern and felt for Christmas so it would be nice to know before buying the pattern. Thank you. LOVE the pattern! just can’t decide the wool felt colours, maybe merman and kitshy christmas and bejeweled and primitive and 🙂 just started following you on pinterest looking forward to more ideas!! My email is [email protected]. I hope I win if I don’t I have the pinned. 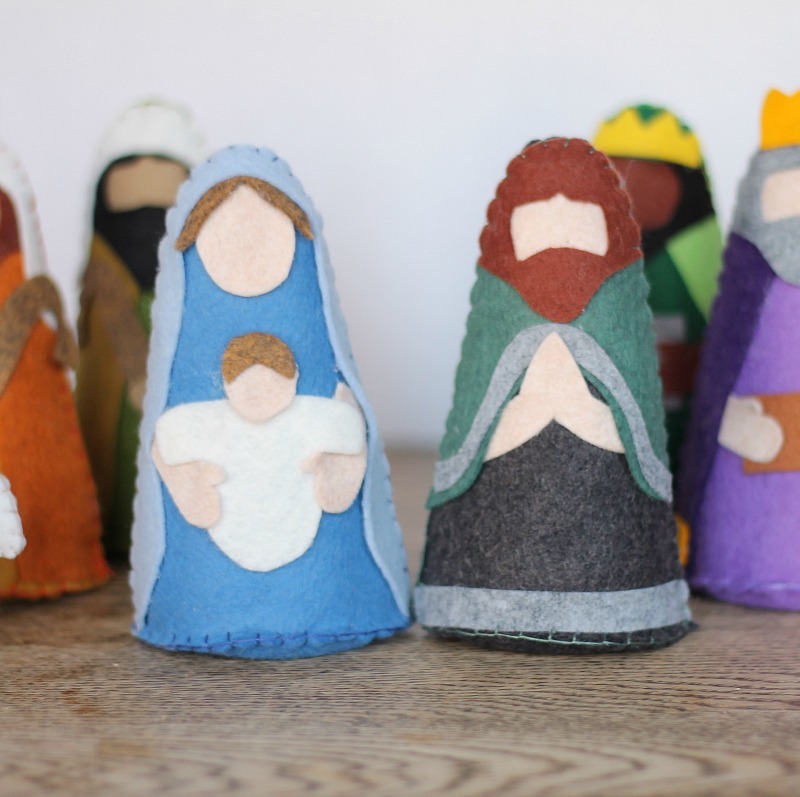 I pinned your Esty nativity pattern for later. I favorite you on Esty. Love everything you did. I like the primitive Christmas . It has pretty colors. Liked you on FB, pinterest, and instagram. I liked Glitter & Glass best. 🙂 And what a beautiful pattern you have created…I love that my kids could play with a nativity and none of us would worry about it breaking. Thank you! Following on Facebook now too. So sweet! I like the heathered collection. I love the Primitive Christmas–such rich colors. Would love to make this Nativity for my grandson! I am following dosmallthingswithlove on Instagram. So excited to have found you! I follow Benzie on Instagram. Wow! That is such a darling nativity. You are so talented. I love the succulent color scheme. Love the Sugar House Collection. Regular customer of Benzie! Love your Nativity set! I’m following you on Instagram. My favorite is the Feast! This looks amazing and it looks like something I could do! I’m following both of you on social media. Following Benzie & Small Things on IG & Facebook. Love love love this pattern!! Thanks for the opportunity! I love benzie’s sweet succulents combo. I love the bejeweled collection! And also following via Facebook! What a sweet nativity! I like all of the color collections, but Feast is my favorite. I have followed each of you on all of your social outlets!! Love this beautiful Nativity. Would Love to win for the NICU I work at in Phoenix. I am following you on your Pinterest NOW! :)Thank you for making such a wonderful and sweet interpretation. Such a lovely pattern!! I follow you and now Benzie on Facebook. I love the Primative Christmas but Glutter and Glass is my favorite!! I love this nativity! So beautiful. 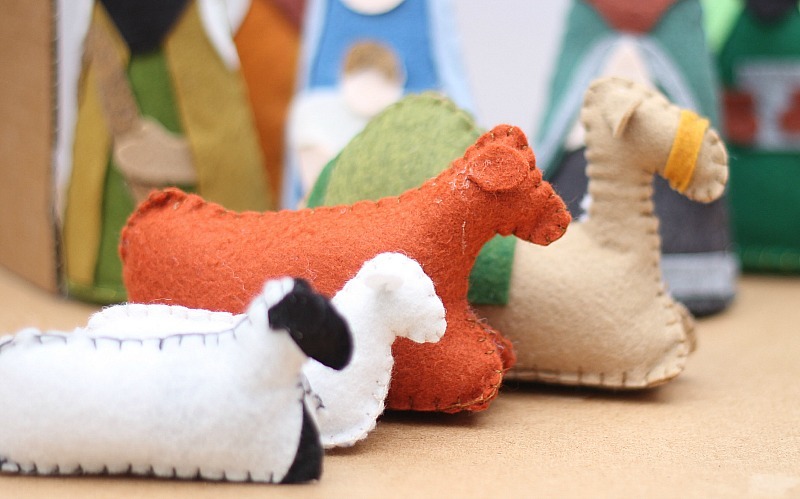 I checked out the lovely felt and i love the noia land collection! Great colors. oh! Secret Garden is my favorite! What an awesome pattern, very kid friendly! Loving the Feast combo. Oh my word, these are so cute! I would love to make these. It was so hard to pick a collection a felt, all of it looked so pretty. I finally decided on the Heathered Collection. Fingers crossed! I’ve liked everything in the links! Thank you! I love this Nativity Set…great job! I would choose the Primitive Christmas felt for it…I love the neutral, but rich, tones. 🙂 Planning to go “like” the other pages! this is an amazing creation you made! Tells the real reason behind Christmas! I been looking for a nativity scene for a while that’s soft not easy to break this is perfect. I love the bejeweled colection colors! Love the Browns with the purples and pinks. Such a pretty combo! My email is [email protected]. Thank you for sharing! Sweet Succulents – Following you and Benzie Design on Facebook! Great patterns and beautiful felt! My email is [email protected]. Thanks for the contest! I follow Benziedesign on IG! I love Sugar house shop! I love the Sweet Succulent combo! This is a beautiful pattern (as always)!! I am having a difficult time deciding between heather and bejeweled! Pretty colors all around. I also followed you on Pinterest and Facebook. I love the heathered…but I like them all! Liked Benzie on FB! I love the kitschy Christmas! I would love. Thank you!! Oh, and I’m following you Instagram, Pinterest, and Facebook OF COURSE! Nancy, this nativity set is one of the most stunning I have ever seen; I can’t believe you made it and I can’t believe you created a pattern, too. You rock! Also, so does this giveaway. Sweet Succulent is SO gorgeous. I’d love to learn how to use felt in this way! Thanks for the chance. I love benzie design!!! The secret garden felt is amazing.. love the colors!! So not sure why the rest didn’t come through! Love the sweet succulent combo! Follow you and Benzie on instagram. Such a cute nativity scene! This is adorable, I love the kitschy christmas color combo. Your ballerina doll is adorable too. The Sweet Succulent felt is just beautiful! This set is SO cute! I have some little granddaughters who would love this! and as for a favorite collection on Benzie Design (are you kidding me, they are all beautiful) but if I had to choose, I love the Heathered Originals! I really like the Feasty colors for this pattern. Such an awesome idea! What age do you recommend is old enough to follow and put these together? Maybe with adult help and supervision? Your felt pattern is wonderful and I think I still have time to get it done by Christmas:) My email address is [email protected]. I checked out Benzie Design and I really like the sand dunes color combo. I liked your etsy shop and I follow Benzie Design on FB and I like the sand dunes color combo. I follow you on FB and I like the sand dunes color combo. I follow you on Pinterest and I like the sand dunes color combo. My favorite is the sweet succulent colorway. And, the nativity set is absolutely darling! Feast! And following on Instagram! I follow Do Small Things with Love on facebook. I have been looking for a pattern like this. I love the primitive Christmas color combo! I checked out their site and love the felt pompoms! I love wool felt, heathered. LOVE THE PATTERN AND FELT!!!! I’m following them on IG! What a great pattern! I love the kitschy christmas color combo! Also following both Benzie Design and Do Small Things with Love on FB. OK I am absolutely in love with this. My children would LOVE it! My favorite is the secret garden collection. So pretty! My email address is andrea . mercer at gmail dot com. I follow you on facebook and bloglovin. Oh do I love this pattern – you are so talented. I love the sweet succulent color combo.